"It is great for the country to see two programs that try to do it the right way," Meyer said. "There is no shortcuts. You hear about some of these things going on in college athletics, reform -- I keep hearing we are going to reform college football. You don't have to. Florida and Ohio State make it every year, it is all good." 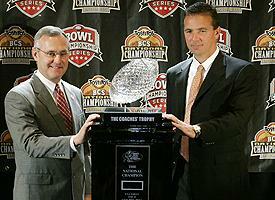 Neither Jim Tressel nor Urban Meyer took immaculate roads to the BCS National Championship Game. It was pure, unintentional comedy. There is nothing better in sports than seeing history rewritten, and the Meyer and Jim Tressel stories were redone to turn the Tostitos BCS National Championship Game into the Paragons of Virtue Bowl. Let's review the "right" way that Meyer and Jim Tressel have done things, shall we? Tressel's quarterback at Youngstown State received $10,000 and other illegal benefits from a booster. At Ohio State, Maurice Clarett said the program provided players with cars and bogus jobs, which were supposedly fronts to supply easy cash to players. Those allegations weren't proven, but Tressel's current star, Troy Smith, was later busted for accepting $500 from a booster. Meyer came to Florida with a reputation for being tough and unrelenting. The same coach who, at Bowling Green, set up trash cans around the field and ran his players until they vomited, all of a sudden developed a softer touch at Florida, where job security is a fleeting concept and expectations waver between being completely ridiculous and insane. The same coach who had 12 players leave his program at Bowling Green because he possessed the bedside manner of Marsellus Wallace reinstated troubled, but talented, defensive tackle Marcus Thomas after two substance-abuse policy violations. Thomas was later dismissed from the program, but Meyer milked all he could from Thomas before booting him. And last year, three Florida players -- including two playing for the national championship -- were involved in an incident in which an AK-47 was fired in an apartment building. They weren't charged, but someone easily could have been killed. This isn't meant to cut down either Tressel's or Meyer's accomplishments, or dim the shine on their appearance in the BCS National Championship Game. No one is disputing they're both marvelous coaches who genuinely seem to care about their players and their schools. But if we've learned anything in the last week or so, it's that coaches are prone to making suspect choices just as much as the athletes they govern. Today's coaches operate with a little bit of slime. In today's big-time sports climate, they almost don't have a choice. Nick Saban lied to our faces about his interest in the Alabama job because $40 million was on the table and his coaching reputation was at risk in Miami. Bobby Petrino left Louisville before the ink on his renewed contract could even dry because of $24 million and the NFL. Pete Carroll, one of the most affable coaches in the country, returned USC to prominence, but the cost of that won't be determined until the NCAA completes its investigation of Reggie Bush. Coaches know most fans -- not all, of course -- would gladly suffer through a few years of NCAA probation, scholarship losses and a Maurice Clarett, if it meant getting to where Meyer and Tressel are. Most of you think that's more than a fair trade-off. Only a few coaches have managed to be squeaky-clean winners, so you almost can't blame coaches for the shady way in which they navigate the landscape. Besides, what matters most to coaches is not cash, cars and boosters, but wins, losses and championships. If Tressel and Meyer knew years ago their decisions and actions would lead them to Glendale to play for career-defining hardware, there is no way they would do anything differently -- whether it was right or wrong. But a word of advice to coaches who play fast and loose with words, contracts and morals: no more absolute statements about what you stand for. We all know your No. 1 concern is really you.